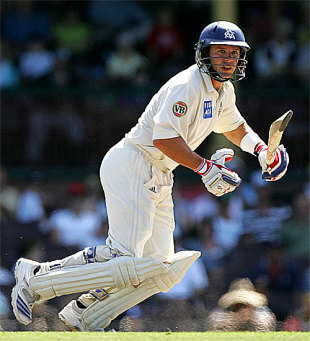 Brad Hodge has made the surprise decison to retire from first-class cricket, ending any chance of adding to his six Test caps. Hodge, who holds a Cricket Australia contract and was said by Australia's chairman of selectors Andrew Hilditch to be very close to selection for this year's Ashes tour, will continue to play one-day and Twenty20 cricket for Victoria. Hodge, who turns 35 this month, said he would play two more Sheffield Shield games before stepping down after Christmas to spend more time with his family. He is the father of a three-year-old son and a five-month-old girl, and having missed the first stages of his son's life due to touring commitments, he was keen not to let the same thing happen for his daughter. "When you drive your car home after you've made some more runs and you see your little boy running around and your little girl, everything comes back into perspective pretty quickly," Hodge said. His cricket career isn't entirely over, though. Hodge is keen to play on for Victoria in one-day and for the Bushrangers and Kolkata Knight Riders in 20-over cricket and as one of the most prolific Twenty20 batsmen in the world, he is hoping to be in the frame for Australia's ICC World Twenty20 squad next year. He said he realised he no longer had the application required for four-day cricket while making 195 against South Australia in a Sheffield Shield match last month. "Peter George had taken the second new ball and I knew what 'Shippy' [Victoria coach Greg Shipperd] was thinking - just get through the new ball, get through to stumps, we can rebuild tomorrow," Hodge said. "That wasn't exactly my plan; I hit Peter George for a massive six, second ball, straight over long-on. "I've never done it in my career and probably never will again. It just wasn't in my make-up, but it signified that something was wrong, the commitment to knuckle down and get through that second new ball wasn't there." Hodge is keen to step aside and allow a younger player the chance to develop and perhaps one day play for Australia. Hodge will have to settle for a six-Test career that ended 18 months ago in Jamaica, when he replaced an injured Matthew Hayden in a one-off appearance. It was a match that few Australians saw and even fewer will remember. Hodge made 67 and was one of Australia's best performers in the victory but, as was usually the case in his international career, he quickly made way when the star player was fit again. However, despite being Victoria's leading run-getter of all time in first-class, one-day and Twenty20 cricket, Hodge said he had come to accept that his international career was not to be an extensive one. "I've played for Australia and I'm grateful and happy that I've been able to do that," he said. "I'm the highest run-scorer for Victoria and I'm very honoured to be in front of (Dean) Jones and greats like (Matthew) Elliott, (Ian) Redpath, (Graham) Yallop, but I think it's time for someone else to step into those shoes and have that opportunity to play for Australia. "Would I like to have played 50, 100 Tests and be a great like Hayden, Langer, Gilchrist and Ponting? Of course, but unfortunately that's not the way the cards have fallen." He will be best remembered at international level for his unbeaten 203 against South Africa at the WACA in 2005-06, although Ricky Ponting's delayed declaration to allow Hodge to reach his milestone might have contributed to Australia failing to win the match. Even so, few players can claim to have scored a Test double-hundred. Another of his first-class highlights was Victoria's 2003-04 Pura Cup triumph, which came after their coach David Hookes died during the season. Hodge tallied 984 runs in that summer and his personal contribution to the success made the win even more memorable for him. But there remains unfinished business. Victoria haven't won a domestic one-day title since 1998-99, and that is something Hodge would like to see change before he quits the game for good. In Hodge's six Tests he scored 503 runs at 55.88 and he has so far also appeared in 25 ODIs and eight Twenty20 internationals. One of Australian cricket's most consistent run-getters, Hodge's first-class runs for Victoria total 11,278 at 47.39. He also had stints with Durham, Leicestershire and Lancashire in the county circuit and overall his first-class run tally is 17,012 at 48.88.